Departure for Cuernavaca, about 82 kilometers or approximately (one hour’s drive) from Mexico City. At that place, known as “City of Eternal Spring”, you will visit the Cathedral, built on the XVI century, which walls still show some frescoes. Then we will continue on to Taxco, 85 kilometers and an hour and a half further, famous for its silver jewelry. 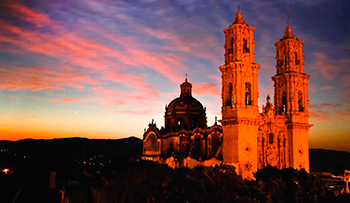 There, you will see the Santa Prisca church, dating from the XVIII century, a jewel of Mexican baroque architecture. And the most important, you will have the opportunity to walk through its many silver shops. – Services and fare guaranteed with minimum 2 passengers.